Do you remember those Nimbu soda available on streets during hot summers or on humid sweaty weather, where the bottle is sealed using a lakhoti (marble)?!?! It is also called Banta Soda in Northern India..Here, i have tried to recreate that version without using aerated(soft) drink!!! We don’t store soft drinks at home. 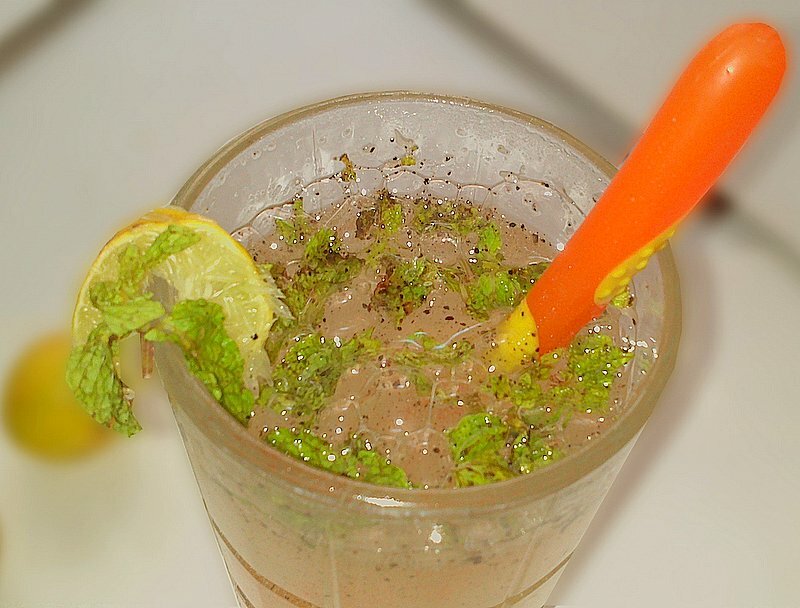 So i use the Meetha Soda (Soda Khar – powdered) that i have at home to make this refreshing drink!!! And this way of making it is so easy and you get to customize the taste to suit your palate!! The inspiration is from my mom, she used to make home-made soda by mixing limbu na phool (Citric acid) and soda. And later in a science class i realized that Soda is basic in nature and Citric Acid is, well, acidic in nature. When they meet in the water, you see the (re)action in form of the bubbles!!! This exact trick is used in making Khaman also, where both the soda and citric acid are used. 1) In bowl take all the ingredients except Meetha soda and mix well (to make nimbu paani). 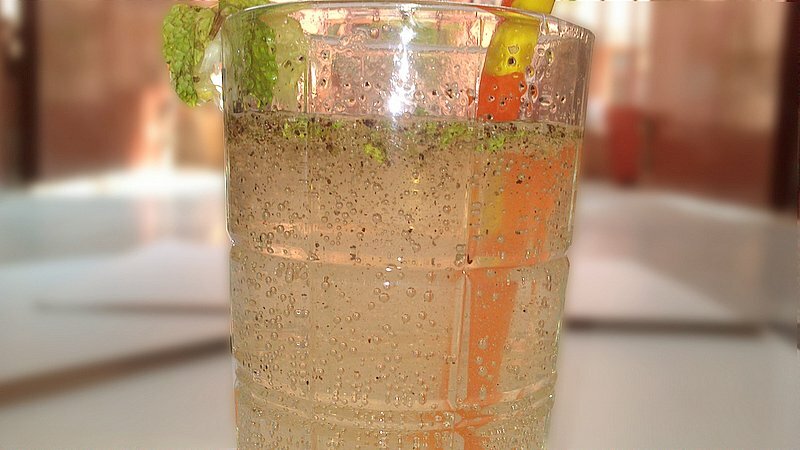 2) If you are don’t like to have any solids in your drink then, keep aside the nimbu paani for 15 minutes (so that all the flavors seep in the drink) and then drain using a channi.if you don’t mind the mint leaves and black pepper solids in your drink then don’t drain. 3) Pour out in the glass at the time of serving and add meetha soda to it, mix for 2-3 seconds and enjoy your homemade Nimbu Soda!!! 1) You can customize this drink to your choice. i.e my hubby doesn’t like mint, black pepper and bhuna jeera in his drink. But i like everything except black pepper, especially fresh mint!! and my in laws love everything including black pepper!!! So 1st make nimbu paani/lemonade as per your taste and then add meetha soda to convert that into fresh lime soda customized to your taste buds. 2) If you have and want to use the drinking soda / sparkling water then skip mitha/powdered soda and water. Mix everything except soda in a tablespoon of water, use powdered sugar. Once everything mixes well, add sparkling water/drinking soda and enjoy immediately. 3) You can also use the Shikanji powder readily available. In that case skip every masala except sugar and mint. I don't like Soda in my drink!!! I will try this sans the soda!!! Even I have adapted a fresh lime juice recipe….1 lemon, sugar to taste, salt & mint poder….put all this in a mixer (woh juice wala attchmt), run it….and later pour & drink it. Heavenly!! I love limbu soda ! after dinner its a wonderful thing to have ! 😀 its way too popular in gujarat I guess ! Indeed!! We need something refreshing in this summer! !